This year, with the encouragement of Scotty Bloom, I decided to enter the 3rd annual Baja Rally down in Mexico for my first ever rally. Scotty is a good friend and is the founder of the event. 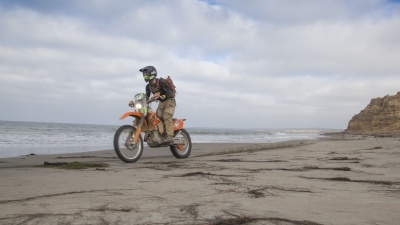 The 4 day ride covers almost 900 miles up and down the coast of Baja California. 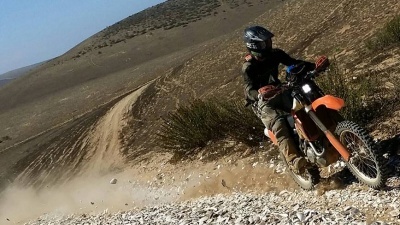 The dry desert and coastal breezes made for an amazing ride as we ventured through sandy trails all along the beaches, through wide open desert plains, and into narrow tracks barely wider than your rear tire. 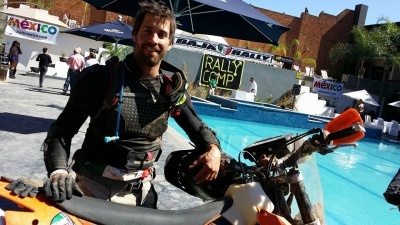 37 riders entered this year’s rally, with only 27 finishing. Upon arrival I was taken aback at the level of professionalism and the depth of talent on hand. Immediately I was concerned that I might be in over my head! Before this I had only had one session of navigation training from Dave at Rally Management Service. 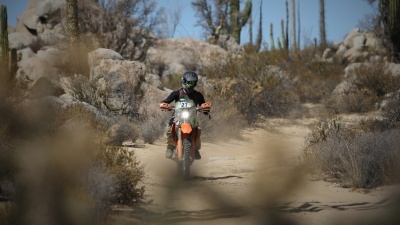 The session was great and I learned a ton, but was it enough to compete in a 4 day rally? I had intended to do more before the race, but the always busy schedule here at AltRider limited my options. 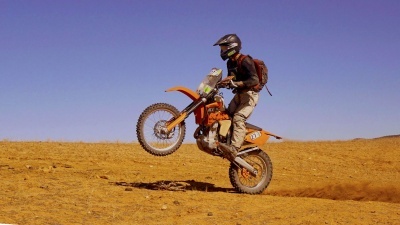 I entered the event on a 2006 KTM 525 SX. It was originally intended for a snow bike project earlier in the year, but this was now going to be my race bike. 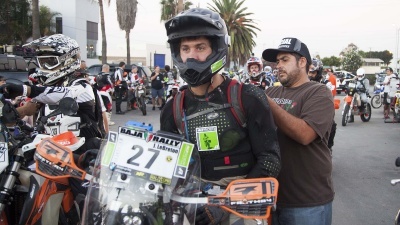 The day began in Ensenada, departing at 6:30 am for a 2 hour ride to the Stage 1 start point. A police convoy and support vehicle escorted the riders out to the city limits of Ensenada. It was a cool experience to be in a line of 37 riders bombing out of town with cops blocking the intersections as best they could.... We then navigated the way to the start of the race on the beach. This was a big learning day as I not only got used to the groove of things, but also worked to familiarize myself with the navigation and tracking systems. A mid-day required fuel stop in Punta Colonet split the stage and gave a moment of rest before continuing on to Rancho El Coyote Meling. The break was very much welcomed, allowing me time to asses how I was doing and evaluate my gear. The KTM 525 was certainly not geared tall enough for these kinds of speeds, and oil consumption was a big concern. After going through an inspection I was glad to find I did not need to use any from the bottle I was carrying. Stage 2 began bright and early, departing at 7am for a full 6 hours of riding. This was by far the most technical stage, with a savage rock section toward the end that felt as if it would never end. One thing that can happen when you start off well is you can get a little too eager. There is a balance you have to strike between pushing yourself and pacing yourself. On day two the confidence and drive from completing the first day caught up to me and ended up costing in two crashes, a loss of navigation, and a medium finish. I spent time trying to navigate while carrying my broken windshield to the first optional fuel. In hindsight this was a terrible idea, as it was nearly impossible in that kind of terrain. It was exciting to get up close to the fast guys, but then only to make small but timely mistakes. I had trouble remaining calm and the excitement of racing went to my head. As you might expect from these days starting as early as they do and being so close to the water, we ventured out on day 3 in some deep fog. 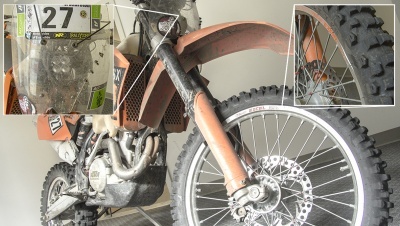 This made navigating the terrain more difficult, but of course this affects all the riders and can be beneficial if you are able to avoid mistakes. Others chose to follow the leaders and this can also be dangerous as you may end up in the same sticky situation if the guy ahead of you is lost. The fog eventually cleared up and it turned into a fairly high speed section. By this time in the race I really began to feel everything starting to come together, and I was able to consistently hit my waypoints and maintain good overall speeds. At this stage in the competition it is pretty common for physical, mental, and mechanical issues to start creeping up. Some of the leaders made mistakes early on in the day and then had a few crashes and mechanical issues later in the day that helped me end stage 3 in a great position. The last leg of the race entailed an early start as we looped our way back to El Rosario. Unfortunately this was the day that all hell broke loose for me. At the start of the day I was in 4th, but missed a waypoint and lost some critical time. I found Patrick Reyes from Coast to Coast and teamed up with him to find the crucial navigation point. The added distance, higher speeds, and deeper sand had me running out of fuel before being able to get to the next station. Already having used the spare fuel I had on me, I had to make a decision: ride across a long field to find fuel at a random farm in the middle of nowhere or gamble to see if I could make the last 40km. It was a wise choice evaluating the fuel level in the tank as I tried to negotiate in broken Spanish to an older farmer, whom ultimately got his son to help with translation. Together we figured it out, getting a hose and bottle to siphon from their pickup truck. During that time I could hear at least 4 riders passing the farm off in the distance. For their help I tried to give them 10USD. Although initially they would not take my money I put it in his hand, heard “Gracias”, grabbed the throttle, and took off. Finally back on track it wasn’t long until I started collecting riders I had passed earlier. I recognized Patrick as I came upon him in a high speed sweeping corner. I was in good shape to pass him, flat tracking on the inside, when suddenly he ran out of gas himself! Slowing and running toward the inside (all in mere seconds) I ended up slamming into the back of him at about 35 mph. His forward driving rear tire knobs easily lifted the 525 KTM up as the bike and I were now fully committed to a supermoto slide. The motion simply lifted and slammed the bike and I down on our sides and knocked the wind out of me. Patrick was concerned, asking if I was okay, but for a solid minute and a half I was unable to respond. Eventually I told him I would be fine and for him to grab some of my gas as the farmer set me up with plenty. He took off as I collected myself back onto the bike to begin to manage the pain and complete the race. Later I learned I had broken 3 ribs. At this point I am riding with broken bones, a bent rim, and a windscreen held together by zip ties. Needless to say I was not going fast, but the end was quite technical as the organization did a good job hiding the waypoints towards the close of the course. No longer at rally race pace, the slow speed allowed me to concentrate on navigation and finding the waypoints to make overall good time. The whole ordeal resulted in a loss of 9 spots and a medium finish for the day as I rode into El Rosario. After that it was another 2.5 hours back to Ensenada where the ceremonies were held. Way to represent the beautiful Pacific Northwest, love ya!!! Great to see you do so well. I followed you online the first few days and then seeing you at the finish line was awesome. That sounded a bit creepy, huh? Pro class next year for you, my friend! Ah yes, the old broken ribs trick. Nursing a few broken ones myself right now. Congrats on doing that ride. You ARE a very good rider. Here in Pennsylvania, you could ride a GS1200 (a couple of years ago) anywhere I could ride my DR650. Great experience in Baja, this is allways the same for us locals, I specially like your comments about being hooked, this is true for everyone that rides down here, so bring your friends, its open all year round.! !